Here’s another infographic as a treat in the end of the work week. It’s SWELDO day today so be sure to treat yourself a little. Hope that the coming weekend will be great! 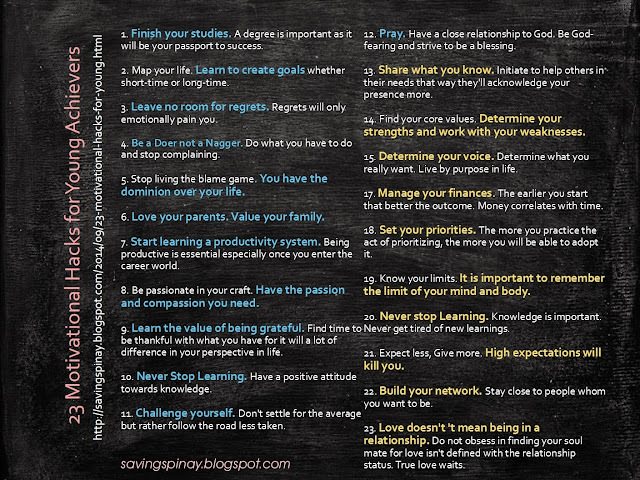 Today’s Infographic is about 23 Motivational Hacks for Young Achievers. I have always believed in that age is our greatest advantage. I hope that through this infographic you will be inspired more to achieve things.